Although drugs and surgeries can help you manage your arthritic pain and symptoms, which include swelling and stiffness of your joints, fatigue and inflammation, a healthy lifestyle should always be the cornerstone of your treatment. Yoga, stretching and walking can help keep your joints active and maintain a good range of motion, but you can also modify your diet to decrease the level of inflammation in your body and alleviate your arthritis symptoms. Omega-3 fatty acids can have an anti-inflammatory effects, but tomatoes could worsen your pain. You probably eat tomato or tomato-based products daily, without even realizing it. 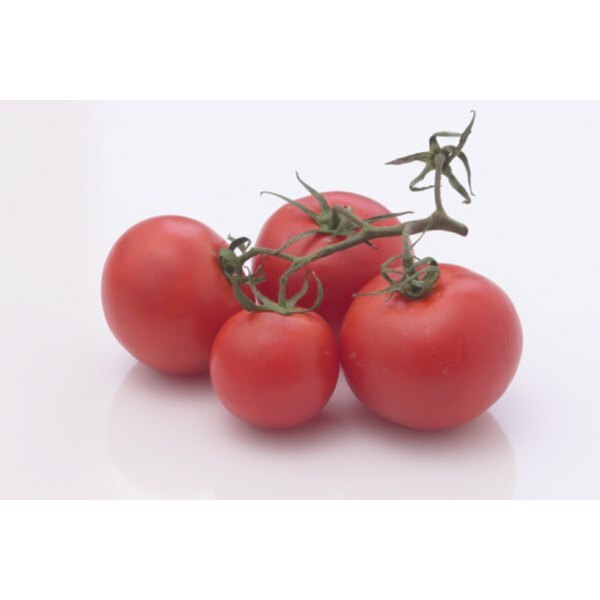 Tomato is in salads, ketchup, salsas, tomato paste, pasta sauce, lasagna, pizza, Mexican dishes, stews and soups. Tomatoes differ from most other vegetables because they belong to a family of plant called solanaceae, or nightshades. Before the introduction of the commonly used drugs to manage arthritis, in the 1970s, some researchers noticed an association between tomatoes and nightshades and arthritis symptoms, according to information presented in a study published in 1993 in "Journal of Neurological and Orthopedic Medical Surgery"
Arthritis is a disease of inflammation and nightshade vegetables like tomatoes contain some compounds that can contribute to the inflammation process, causing more swelling, joint pain and stiffness. A study published in 1993 in "Journal of Neurological and Orthopedic Medical Surgery" suggests that eliminating all nightshades, including tomatoes, from your diet can help greatly reduce your arthritis symptoms. Unfortunately, no randomized clinical trials confirm the relationship between arthritis, tomatoes and other nightshades. With diet, there is no one-size-fits-all approach and you will need to determine for yourself whether tomatoes may be involved in exacerbating your inflammation and arthritis symptoms. An elimination diet will allow you to conduct your own experiment with yourself as the guinea pig. All you have to do is to completely eliminate all tomatoes from your diet. Read ingredient lists to avoid all traces of tomatoes. Following your elimination diet for four to eight weeks is enough to help you decide whether eliminating tomatoes improves your arthritis. At the end of your elimination diet, add tomatoes back to your diet and see if your arthritis worsens. If your elimination diet does not result in significant improvements or only partially improve your arthritis, your symptoms may be the result of other nightshades you have in your diet. Potatoes, peppers, eggplant, paprika, cayenne pepper, chili pepper, Tabasco sauce and goji berries belong to the same family as tomatoes and could also induce inflammation. Try an elimination diet that removes all nightshades plants from your diet at once before ruling out tomatoes and nightshades as a factor in your arthritis symptoms. Does Apple Juice Prevent Gout?